We are fast approaching the Christmas festival season and we would like to say a huge thank you for supporting us over the last year. In 2015 The Hatfield Practice has provided over ten thousand treatments to local people. We have received some fantastic comments and made many friends a long the way. The comments include a selection about our service on both Free Index and Google while some detail information about individual practitioners and staff that work here. We want to say thank you to everyone that has helped us this year. A discounted rate into into Christmas !! Both Lara Inge and Tracey Weaver are experts within this field and are here on selected days throughout the week ready and waiting! For the second consecutive year due to popular demand we are offering gift vouchers at the Practice. Gift Vouchers are a way of introducing somebody to a treatment that you love so dearly, presented within a beautiful personalised presentation card and can be used whenever they like over Christmas and on into 2015. Christmas present sorted! 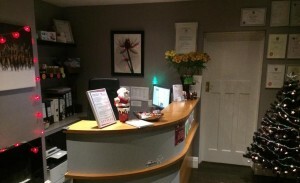 Information on all types of treatments we offer at the Hatfield Practice can be found by selecting the ‘Treatments’ tab above. 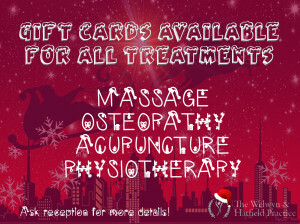 Gift cards are available for Homeopathy, Sports Therapy, Reiki, Osteopathy (All types), Acupuncture (all types), Physiotherapy, Massage (all types) and Pilates. I have visited this clinic for around a year now and used Helen for Acupuncture. The results are amazing a very friendly place very much recommended by myself daughter and Son in law FAB!!!!!!!! All staff at the Hatfield practice are brilliant and welcoming, the work they do has really helped me to get back to normal after having back problems really quickly.